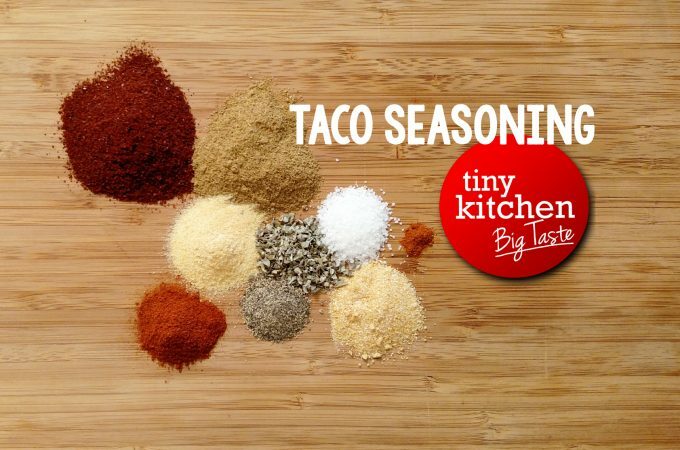 When I create recipes for Tiny Kitchen Big Taste, many of them go through a lot of testing. This was one of them. You might be thinking, “They’re roasted potatoes…what’s to test?” Well, I’m glad you asked. Actually, you didn’t…I just suggested you did so that I could tell you about all the different ways I tried this recipe until I came up with the perfect combo that I deem The Best Roasted Potatoes Ever! Let’s start with the potatoes. 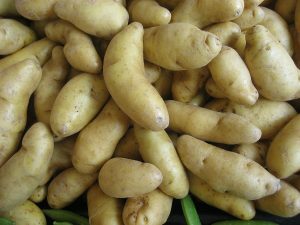 I tried Idaho Russet Potatoes, White New Potatoes, Fingerling Potatoes, and the ever-popular Yukon Gold Potatoes until I decided on Small Red Potatoes. 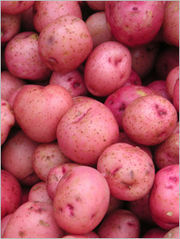 The red potatoes were the clear winner for a couple of reasons, namely size and texture. Red Potatoes’ texture is traditionally firm and waxy; thus, they tend to stand up to dry high heat better, which is exactly what we’re doing in this recipe. Fingerlings were a close second because they, too, have a waxy, firm texture that stands up to the heat. 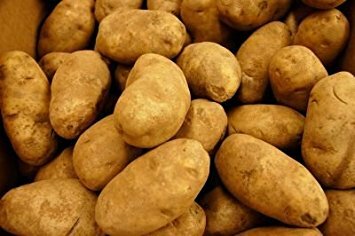 But, unfortunately, although very cool because of their thin elongated shape, they tend to be pricier than the good ol’ red potato…so for that reason alone, they fell to the number two spot. If price is no object, by all means the Fingerling potato will give you great results in this recipe. The Yukon Gold are great frying potatoes, but the larger size of them did not make them the best fit for this recipe. So, thinking the smaller white variety, that kinda look like the Yukon Gold from the outside might do the trick. Nope. 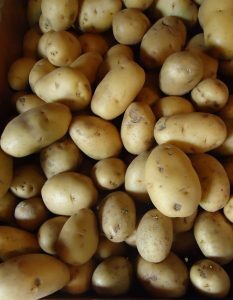 While somewhat firm, they have more of a starchy texture to them…so the result is a potato that breaks down a bit in a high heat oven. They’re passable though. The only potato that really did not work at all was the standard Russet Potato. Let me state for the record that I love Russet Potatoes. 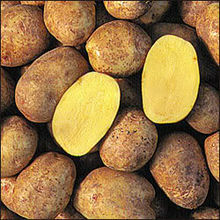 Awesome in mashed potatoes and nothing makes for a better Baked Potato than a Russet. That, is unfortunately, the problem with them in this recipe. Think about the texture of a baked potato…very starchy…which is great when you’re topping it with butter, sour cream, bacon and chives. But for a great roasted potato, use something else. Plus, their larger size was the second strike against them in this recipe. As for oils, I considered traditional vegetable oil, avocado oil and olive oil. While avocado oil is great for high heat cooking, it has a very mild taste…just like the vegetable oil. Will they work in this recipe? Yes. But don’t expect the Best Ever results you will get from a very flavorful Extra Virgin Olive Oil. Garlic was a non-negotiable. So was parsley. Fresh Parsley, that is. BTW, dried parsley is not a spice. See the Tiny Kitchen Cheddar Bay Biscuits video. But then what? Basil, Oregano, Thyme…nope. Rosemary? It was a clear winner in this one. Couple of reasons. I was looking for a rustic dish and something that will stand up to roasting. Rosemary hit the mark on both counts. While we finely mince some of the rosemary, we leave some of the needle clusters that will get nice and crunchy in the oven…another texture thing. Plus, the look it gives is perfect and very rustic. Finish it off with a little pepper and Kosher Salt…a little more than you might think as the salt is what’s going to enhance the great garlic and rosemary flavor and bring out the roastiness (you know what I mean) of the potatoes. What could I add that would make this Roasted Potato recipe unique? To answer this question, I tried Pine Nuts first….and I never looked back. 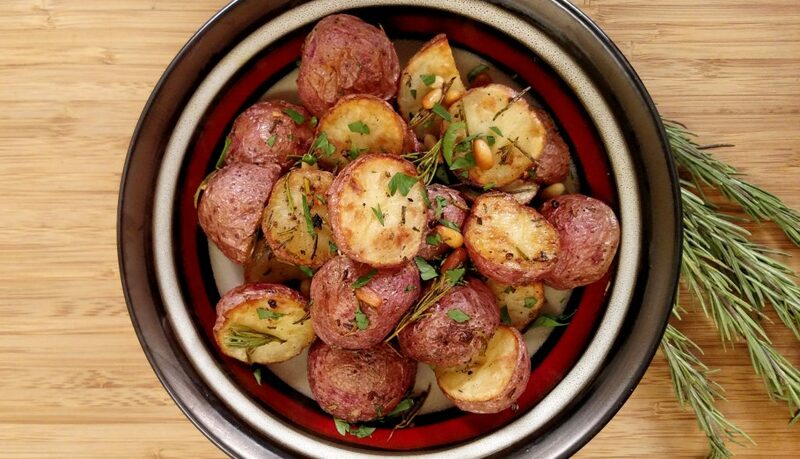 The crunch and creaminess of the toasted pine nuts mirror that of the roasted potatoes but give it an extra level of flavor that complements the other tastes in this dish. And there you have it…five or six tests later for several groups of friends, and we have what I named “The Best Roasted Potatoes Ever!” I recognize it’s a hefty title, but truthfully it comes from the great responses I got from numerous people, including my friends Lee, Joel and Danielle. Where I think this dish really shines is in its simplicity and bold, Big Taste. Like I said, it is a side of potatoes…something that seems simple to make…and, frankly, IS easy to make. Except for the nuts and parsley, throw everything in a bowl. Mix. Bake. Finish off with the nuts and garnish with the parsley. 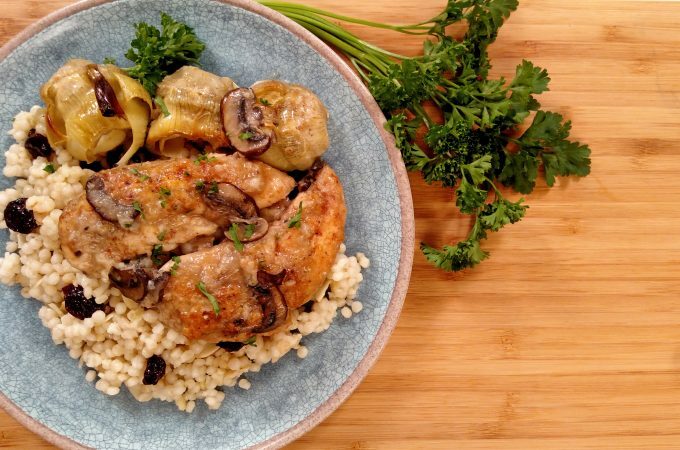 It’s a great side dish for many things, from a nice Pork Loin to a Vegetarian dinner medley to a Roasted Chicken. 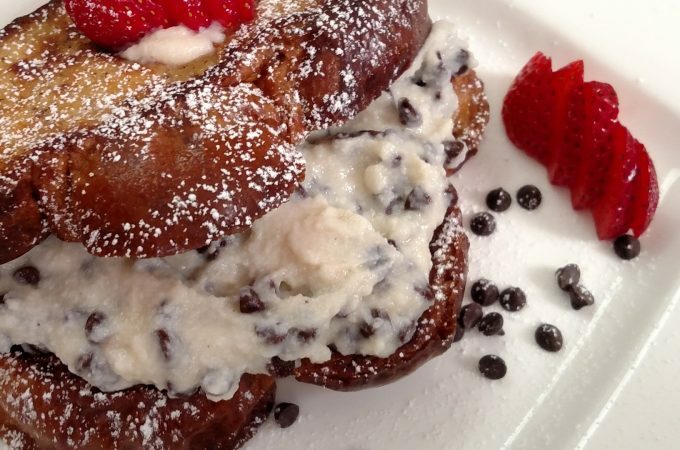 I can’t wait for your to try this recipe and let me know the reactions you get in your home! 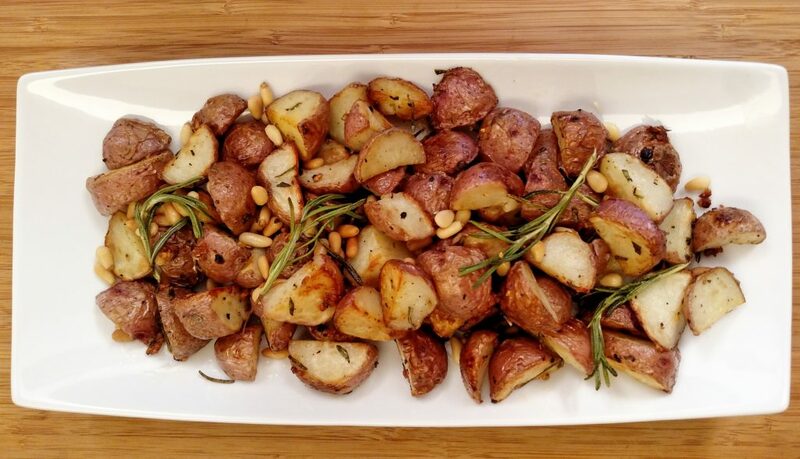 Call them Tiny Kitchen Perfect Potatoes, Roasted Potatoes, Parsley Potatoes or just a Side of Potatoes with Rosemary, Garlic and Pine Nuts…one thing’s for sure…these are The Best Potatoes Ever! Press Garlic and add to the Potatoes. Remove leaves of the Rosemary the stem. Finely mince 1/2 of them. Add minced Rosemary and whole Rosemary to the Potatoes. Add Olive Oil, Salt and Pepper to the Potatoes. Mix Potatoes until thoroughly coated in Olive oil and Garlic and Rosemary is evenly mixed throughout. Bake at 400°F for 30-45 minutes (depending on the size), stirring occasionally so that they bake evenly. Bake until the Potatoes are cooked through and are golden brown. Remove from oven and Garnish with the roughly chopped Parsley.